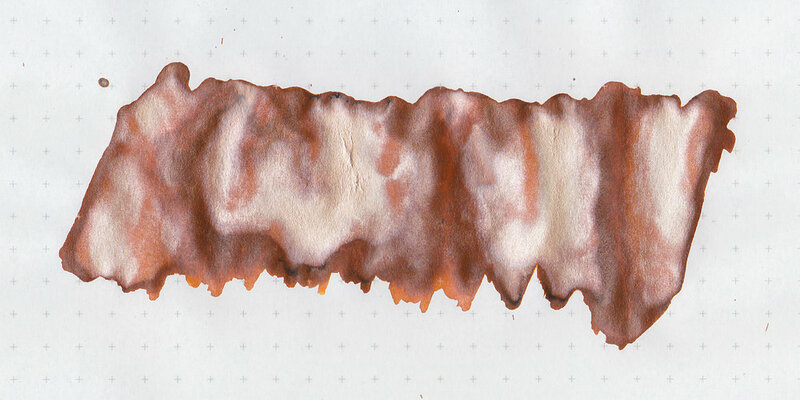 Today's ink is the last of the new limited quantity Shake 'N' Shimmy ink from Robert Oster, Glistening Orange Rumble. Only 100 50ml bottles were made, and each comes with a letter of authenticity signed by Robert Oster. I purchased my bottle of ink from Pen Chalet, the only retailer in the US to carry it right now. Glistening Orange Rumble is a medium orange with lots of silver shimmer. I think this is the shimmer version of Robert Oster Orange Rumble, but I don't have that ink yet, so I'm not sure. On 20 pound copy paper the ink behaved pretty well, there was just a little bit of feathering. 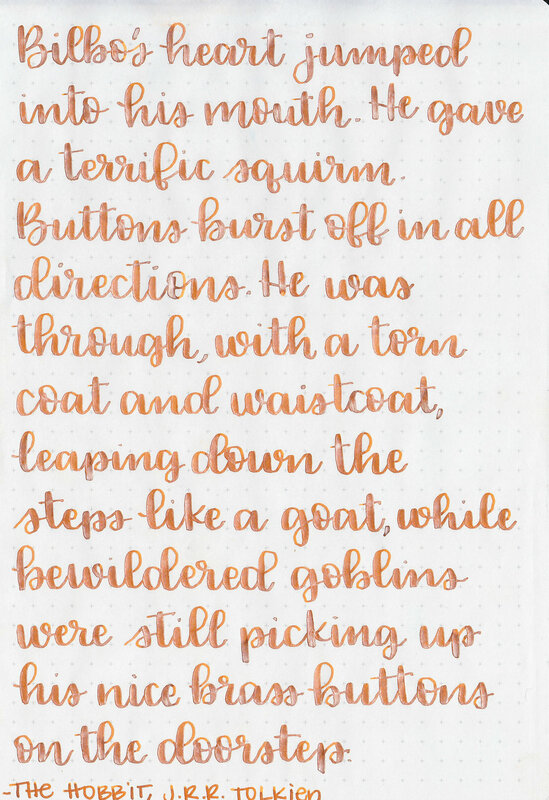 The shimmer clogged the flex nib once while doing these writing samples, and there was some hard starting and skipping in the other nib sizes. Ink swabs for comparison, left to right (top to bottom for mobile RSS): Diamine Inferno Orange, Robert Oster Glistening Orange Rumble, and Diamine Citrus Ice. Click here to see the Robert Oster inks together, Shake 'N' Shimmy inks are at the bottom of the page. Inferno Orange is brighter and has gold shimmer, and Citrus Ice has a lot more yellow in it. Robert Oster Orange, Robert Oster Ng Special 16, and Robert Oster Peach. Click here to see the orange inks together. Overall, it's my least favorite of the new Robert Oster shimmer inks, just because it seems to be the most high maintenance. I like this ink in a flex nib on white paper best, on smaller nibs it's hard to keep the shimmer consistent. Give it a try, you might love it.